Lyse had to establish a user-friendly mapping program for field crews that also had a simplified user interface for office employees. Given that Norwegian authorities have classified the company's energy and telecommunications infrastructure as sensitive information and critical infrastructure, the solution had to be highly secure. That is why Lyse chose to implement Esri Portal for ArcGIS. The solution Lyse came up with is grounded in Portal for ArcGIS, which contains web services that are assembled in different maps and adapted to various users' needs. These maps are made available both on the web and on mobile devices via Collector for ArcGIS. Since sensitive information is involved, the product makes data and information security a high priority. Portal is directly linked to Lyse's private app store, which ensures that only authorized users can access the various datasets and makes administration of groups and users easy. Additionally, the Collector app is encapsulated in a mobile device management (MDM) solution, where access to apps and information is governed. Mobile devices and tablets are also enrolled in MDM, and a part of the device storage is isolated and encrypted, making all communications secure. Thus, Lyse retains full control of company information on the devices without affecting employees' private apps and photos. And if someone leaves the company or loses the device, an IT administrator immediately removes the company's data from it. The solution is simple and intuitive. With the app available in Lyse's app store, Android and iOS users of all IT skills can easily access, download, and begin using it without prior training. Now, field crews can connect to Portal and access web maps on their mobile devices, and employees in the office can access easy-to-use web maps on their computers. With these maps—which accurately locate all the energy and telecommunications assets in Lyse's network—fieldworkers can immediately identify and start any investigations without having to wait for a coworker to send them the information they need. "The map has become an even more important surface for information sharing at Lyse," said Lyse Group chief information officer Geir Arve Vika. "Access on all types of devices has especially given our field crews an important tool. And it is, of course, pleasing to see the efficiency gain the fieldworkers get from the solution." Today, more than half of the company's 1,300 employees use Lyse's Portal, with more than 150 technicians accessing the app on a daily basis. 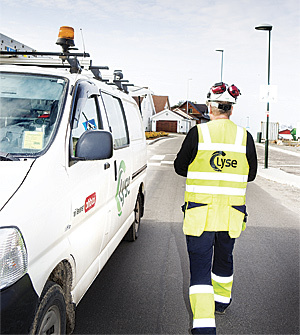 Lyse's asset management processes have progressed significantly. Overall, Lyse field crews view the app and the online maps as tools that help them do a better job. Fieldworkers report that they save up to 30 minutes per day using the Portal software-based solution, mostly because they don't have to spend as much time retrieving needed information or troubleshooting. Several business units at Lyse have also made Portal central to their operations. Since almost all the company's activities have a geographic component, the maps ensure that employees in the office interact with crews in the field. They also facilitate information flow between various teams, such as project development and asset maintenance or operations and customer care.